Exercise intolerance is one of the main clinical features in patients with heart failure and preserved ejection fraction (HFpEF), which have a significant implication on quality of life and prognosis. Several studies using noninvasive and/or invasive methods have investigated the mechanisms of reduced exercise capacity (EC) in patients with HFpEF and concluded that there is no single responsible factor but multiple once.,,,,, The majority of previous studies that have evaluated the association between conventional echocardiographic variables of LV systolic and diastolic function at rest and EC failed to find a relationship between LV systolic function and EC while diastolic function showed a more pronounced correlation.,,,,, Given that subclinical systolic dysfunction represented as reduced global longitudinal strain (GLS) has been documented in patients with HFpEF using speckle-tracking echocardiography (STE),,, we hypothesized that these patients might have reduced EC despite preserved left ventricular ejection fraction (LVEF). The aims of the present study were to evaluate the relationship between EC and conventional LV diastolic and systolic function as well GLS determined by STE echocardiography. We also sought to determine independent predictors of reduced EC in patients with HFpEF. This was a prospective, cross-sectional study examining 172 consecutive patients who presented with multiple atherosclerotic risk factors and were referred for cardiology assessment to either an academic cardiology clinic or a private specialist clinic in Skopje. Patients with unexplained dyspnea and/or exercise intolerance who fulfilled clinical and/or echocardiographic criteria of HFpEF presence were enrolled in the study. To be eligible for the study, patients had to have a sinus rhythm, normal lung function tests, and normal blood counts. The Medical Ethics Committee of involved institutions approved the study protocol, and signed informed consent was obtained from all enrolled patients. Standard assessments and calculations of LA and LV dimensions as well volumes, wall thickness, LV mass, and stroke volume (SV) were evaluated in standard views on commercially available equipment (Vivid 7, GE) according to the professional association recommendations, and were normalized to the body surface area (BSA). Mitral and pulmonary venous flow parameters using PW-Doppler were measured. Pulmonary artery systolic pressure (PASP) was estimated from tricuspid regurgitation jet. Pulse Wave-tissue Doppler imaging (PW-TDI) was performed in the apical 4-chamber view to assess annular systolic (TDIs'), early (E') and late diastolic velocities (A') at septal and lateral wall and the ratio of mitral flow E wave to E′ (E/E' ratio) for each of these annular velocities as well it's average value was calculated. The recording was performed at a sweep speed of 100 mm/s at end-expiratory apnea. The average of three consecutive cardiac cycles was taken for measurement of each echocardiographic index. The LV apical long, four- and two-chamber images at frame rates between 55 and 80 frames/s were used for assessing two-dimensional speckle tracking LV longitudinal strain. During breath hold, three consecutive heart cycles were recorded and averaged. Global peak systolic longitudinal strain (GLS) was derived from the average value of 17 segments [Figure 1], and each segment was analyzed individually. After the segmental tracking quality was assessed and eventually manually adjusted again, the analysis was performed using acoustic-tracking software (Echo Pac, GE, USA). To assess the reproducibility as well as the reliability of the LV strain measurements, we calculated the intraclass correlation coefficient (ICC) by assessing 20 randomly selected images seen in two different occasions by the same investigator. The ICC for LV longitudinal strain measurements was 0.943 (95% confidence interval 0.872–0.974). Symptom-limited exercise test using treadmill was conducted according to the Bruce protocol. Testing was terminated as a result of symptoms occurrence, achievement of maximal predicted heart rate (HR), exaggerated hypertensive or hypotensive response, severe arrhythmias, or marked ST-segment displacement. EC was measured in units of metabolic equivalents (METs). We defined reduced EC as <7 METs. Categorical parameters were summarized as percentages and continuous parameters as a mean ± standard deviation. The difference in clinical and echocardiographic parameters between two groups was tested using Student's independent-sample t-test for continuous variables and Pearson's Chi-square test for categorical variables. Assessment of correlation of METs with various echocardiographic parameters was done using Pearson's correlation analysis. Multiple logistic regression analysis was performed to determine independent predictors of METs <7 presence. All data analysis was performed using SPSS version 22.0 (IBM SPSS, Inc., Chicago, Illinois, USA) and P ≤ 0.05 was considered as statistically significant. Inclusion criteria were fulfilled by 172 patients (average age 62.0 ± 9.7 years), 68 (39.5%) men and 104 (60.5)% women with average body mass index (BMI) of 29.6 ± 4.0 kg/m 2 and average EC of 7.4 ± 1.7 METs. Patients had a mean New York Heart Association (NYHA) class of 1.5 ± 0.5. According to their EC out of 172 patients, 54 (31.4%) reached <7 METs and 118 (68.6%) reached ≥7 METs on the exercise test. Baseline characteristics of the patients according to EC defined by <7 METs and ≥7 METs are shown in [Table 1]. Besides being significantly older, mostly women with higher BMI and with higher waist circumference, and higher NYHA class, patients who reached <7 METs did not show any statistical significant difference regarding atherosclerotic risk factors, coronary artery disease presence and/or used medications except for diabetes which was more frequently present in patients with <7 METs, a result that was borderline significant. Resting HR and blood pressure were significantly increased were in patients with <7 METs. 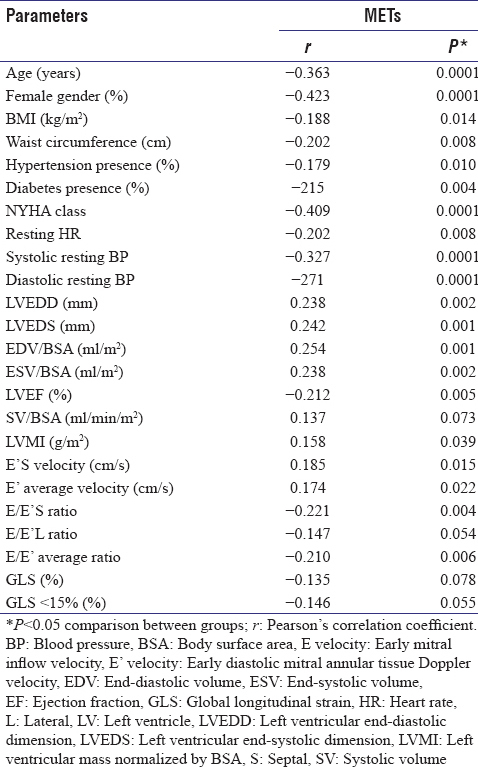 Lower METs reached during exercise showed significant association with advanced age, female gender, higher BMI and waist circumference, hypertension and diabetes presence, higher NYHA class, increased resting HR and systolic and diastolic BP, shown in [Table 2]. Although patients with METs <7 compared to those with ≥7 METs had insignificantly lower LV diameters and volumes in diastole as well as in systole, almost identical septal and posterior wall thickness, higher LV mass index no matter of the gender, and higher LVEF [Table 3], lower internal dimensions and volumes and higher LVEF showed significant association with decreased METs [Table 2]. Relative wall thickness (RWT) was in favor of concentric LV hypertrophy without significant difference between the two groups of patients. SV/BSA and TDIs' in patients with METs <7 were lower [Table 3] as well lower SV/BSA was with borderline significantly associated with lower METs [Table 2]. The LA internal dimension and its' indexed value in patients with METs <7 [Table 3] were above normal, but almost identical in both groups. LAVI was insignificantly higher, and LAEF% was insignificantly lower in patients with METs <7 [Table 3]. As for diastolic parameters [Table 3], comparison of conventional transmitral inflow parameters, pulmonary artery flow parameters, and PASP among patients divided according to METs showed the absence of significant differences among groups. E' and E/E' ratio regardless of the level at which they were assessed were insignificantly lower or larger in patients with METs <7 in comparison to those with ≥7 METs. Lower E' at either the septal level or taken as an average along with higher E/E' ratio measured at the same levels showed a significant association with decreased METs [Table 2]. GLS derived from the average value of 17 segments was as expected lower than normal in patients with HFpEF [Table 3] and was significantly lower (more positive) as well as was higher percent of patients with GLS of <15% in patients with <7 METs in comparison to those with ≥7 METs. Reduced GLS and higher percent of patients with GLS of <15% were with borderline significance associated with lower METs [Table 2]. We performed binary logistic regression analysis with <7 METs as the dependent variable and clinical, functional, and echocardiographic variables that showed significant association with reduced METs taken as independent variables. The results [Model 1, [Table 4] demonstrated that increased resting HR and diastolic BP, advanced age, female gender and higher waist circumference appeared as independent predictors of <7 METs. Taking into account that advanced age, gender, and hypertension are well-known as factors that usually limit EC, we excluded them and performed another logistic regression analysis. The results demonstrated [Model 2, [Table 4] that increased HR at rest, higher BMI along with elevated E/E' ratio measured as average appeared as independent predictors of <7 METs. When we put into the logistic model only echocardiographic variables [Model 3, [Table 4] the results showed that only lower GLS% (more positive) appeared as independent predictor of <7 METs. Analysis of the baseline characteristics of 172 patients with HFpEF, divided according to EC measured by METs, showed that patients who reached <7 METs were significantly older, mostly women with higher BMI and waist circumference as well as with higher NYHA class. Advanced age, female gender, higher waist circumference, and hypertension appeared as significant independent clinical predictors of reduced EC represented as <7 METs. These results are consistent with the results of numerous studies ,,,,,,, who showed reduced EC (assessed by peak VO2 or METs) in predominantly older, obese, diabetic, and hypertensive women and concluded that it was not only due to reduced inotropic, contractile, vasodilator, and chronotropic reserve but also to reduction in skeletal muscle mass. Haykowsky et al. confirmed that finding that A-VO2 difference reserve is an independent predictor of peak Vo2 suggest that peripheral, noncardiac factors are important contributors to exercise intolerance in the elderly with HFpEF. As for the female gender, it has been speculated that lower EC could be due to a greater amount of adipose tissue, lower levels of hemoglobin and lower body size, or muscle mass., In addition, consistent with our study, it has been found that increasing BMI and/or waist circumference appeared as significant contributing factors of reduced EC which could be due to specific derangement in cardiac function or rather as a comorbid condition that further limits EC in patients., Meyer et al. similar to our study have found that patients with reduced EC have higher resting HR that could reduce cardiac output reserve and with possible chronotropic incompetence might reduce EC. The current findings were in line with other studies showing a direct relationship between reduced EC and smaller LV cavity size and indexed LV volumes along with increased wall thickness and LV mass index, suggesting that such characteristics were result of adaptive process of which hypertension-induced concentric LV remodeling appears to play an important role.,, Lam et al. used symptom-limited treadmill exercise in patients with different kind of LV hypertrophy and remodeling and found that EC assessed by METs was the lowest in patients with concentric hypertrophy, LV mass index and RWT being significantly negatively associated with exercise tolerance which was related to reduced systolic and chronotropic reserve. They speculated that “occult” systolic dysfunction may be present at rest in concentric hypertrophy, despite preserved LVEF and chamber contractility, and that this systolic dysfunction becomes apparent with exercise. Furthermore, the results of our study showed that SV/BSA was lower in patients with reduced EC which was confirmed in a few studies., Given that SV is generated by changes in chamber volume throughout the cardiac cycle, smaller cavity size is generally associated with a smaller SV. At rest, the reduced SV/BSA appears to be compensated by an increase in resting HR, but both of them could have impact toward reduced EC., Conversely, assessment of LV diastolic function in our study, showed the absence of significant differences between patients divided according to EC. However, lower E' along with higher E/E' ratio measured at either the septal level or taken as average showed a significant association with decreased METs, higher E/E' average ratio being an independent predictor of <7 METs which was in accordance to the results of numerous studies.,,,,, In this respect, Skaluba and Litwin  found that among all the echocardiographic and clinical parameters assessed, E/E' ratio had the best correlation with EC and was the strongest independent predictor of EC ≤7METs regardless of age and/or preserved or reduced systolic function. Furthermore, Otto et al. in a study of patients with preserved LVEF found that significant number of those who had E/E' ratio >10 had limited EC manifested with <7 METs. In the considerable number of patients with preserved LVEF, Grewal et al. showed that patients with LV filling pressure measured by resting E/E' ratio ≥15 had a progressive increase in the magnitude of reduction in EC with advancing age and also concluded that abnormalities of LV diastolic function were independently associated with EC in METs. The speculation of possible pathophysiological mechanisms behind reduced EC and diastolic dysfunction, Gupte and Hamilton  tried to illuminate citing several studies that found extensive stiffness in LV of patients with HFpEF which prevents the increase in LV end-diastolic volume, thus lead to limited ability to use the Frank-Starling mechanisms despite greater filling pressure and also limits augmentation of relaxation velocity during exercise as HR increases. In line with previous observations, we found that global longitudinal LV strain (GLS%) was lower than normal in all studied patients with HFpEF.,, Furthermore, we found significantly lower (more positive) GLS% and higher percent of patients with GLS <15% present in those with <7 METs achieved during exercise. Lower GLS% (more positive) appeared as an independent predictor of <7 METs in the logistic model taking into account only echocardiographic variables. Given that patients with HFpEF have preserved systolic reserve during exercise, exercise-induced stress could “unmask” mild deficits in the systolic function represented with changes in LV myocardial deformation. Thus, Tan et al. studied LV mechanics in patients with HFpEF at rest and on submaximal exercise and found that HFpEF patients had reduced diastolic longitudinal functional reserve which lead to consequent reduced SV rise on exercise, symptoms of breathlessness and lower functional capacity at rest and even more with exercise. Henein et al. confirmed that HFpEF patients despite preserved LVEF at rest have abnormal systolic function reserve limiting their EC. In addition, Hasselberg et al. examined the EC by oxygen uptake (VO2) in patients with preserved and failing LVEF along with assessment of LV systolic and diastolic function as well GLS% by echocardiography. Patients with HFpEF had reduced GLS% at rest which was independently correlated to peak VO2 and was superior in identifying patients with reduced EC. We used calculated METs rather than oxygen consumption as a measure of EC. Although the latter is more frequently used in numerous studies, calculation of achieved METs is a widely accepted clinical tool for determining functional capacity and it has strong prognostic value. Furthermore, the important limitation of our study was that assessment of LV systolic and diastolic function were made only at rest, while well-known principle of exercise physiology is that definitive conclusion regarding mechanisms of exercise intolerance is better to be made during exercise. Furthermore, the study was predominantly focused on the role of LV systolic and diastolic dysfunction on EC, not evaluating peripheral abnormalities and/or chronotropic incompetence. Patients with HFpEF have subclinical LV systolic dysfunction which presents as impaired GLS using STE despite preserved LVEF. Besides conventional risk factors (age, gender, BMI, hypertension) which appeared as independent clinical and functional predictors of reduced EC, increased E/E' ratio and GLS appeared as independent echocardiographic predictors of reduced EC by METs achieved. Thus, our study confirms that along with diastolic dysfunction, GLS appeared as an independent predictor of reduced EC emphasizing the complex pathophysiological nature of HFpEF. In addition, we can suggest that LV longitudinal function assessed by STE should be an inevitable part of the diagnostic and/or prognostic workup of patients with HFpEF. Borlaug BA, Olson TP, Lam CS, Flood KS, Lerman A, Johnson BD, et al. Global cardiovascular reserve dysfunction in heart failure with preserved ejection fraction. J Am Coll Cardiol 2010;56:845-54. Kitzman DW, Higginbotham MB, Cobb FR, Sheikh KH, Sullivan MJ. Exercise intolerance in patients with heart failure and preserved left ventricular systolic function: Failure of the Frank-Starling mechanism. J Am Coll Cardiol 1991;17:1065-72. Borlaug BA, Melenovsky V, Russell SD, Kessler K, Pacak K, Becker LC, et al. Impaired chronotropic and vasodilator reserves limit exercise capacity in patients with heart failure and a preserved ejection fraction. Circulation 2006;114:2138-47. Maeder MT, Thompson BR, Brunner-La Rocca HP, Kaye DM. Hemodynamic basis of exercise limitation in patients with heart failure and normal ejection fraction. J Am Coll Cardiol 2010;56:855-63. Westermann D, Kasner M, Steendijk P, Spillmann F, Riad A, Weitmann K, et al. Role of left ventricular stiffness in heart failure with normal ejection fraction. Circulation 2008;117:2051-60. Haykowsky MJ, Brubaker PH, John JM, Stewart KP, Morgan TM, Kitzman DW, et al. Determinants of exercise intolerance in elderly heart failure patients with preserved ejection fraction. J Am Coll Cardiol 2011;58:265-74. Upadhya B, Haykowsky MJ, Eggebeen J, Kitzman DW. Exercise intolerance in heart failure with preserved ejection fraction: More than a heart problem. J Geriatr Cardiol 2015;12:294-304. Grewal J, McCully RB, Kane GC, Lam C, Pellikka PA. Left ventricular function and exercise capacity. JAMA 2009;301:286-94. Mohammed SF, Borlaug BA, McNulty S, Lewis GD, Lin G, Zakeri R, et al. Resting ventricular-vascular function and exercise capacity in heart failure with preserved ejection fraction: A RELAX trial ancillary study. Circ Heart Fail 2014;7:580-9. Sinning D, Kasner M, Westermann D, Schulze K, Schultheiss HP, Tschöpe C, et al. Increased left ventricular stiffness impairs exercise capacity in patients with heart failure symptoms despite normal left ventricular ejection fraction. Cardiol Res Pract 2011;2011:692862. Kasner M, Sinning D, Lober J, Post H, Fraser AG, Pieske B, et al. Heterogeneous responses of systolic and diastolic left ventricular function to exercise in patients with heart failure and preserved ejection fraction. ESC Heart Fail 2015;2:121-32. Tan YT, Wenzelburger F, Lee E, Heatlie G, Leyva F, Patel K, et al. The pathophysiology of heart failure with normal ejection fraction: Exercise echocardiography reveals complex abnormalities of both systolic and diastolic ventricular function involving torsion, untwist, and longitudinal motion. J Am Coll Cardiol 2009;54:36-46. Yip GW, Zhang Q, Xie JM, Liang YJ, Liu YM, Yan B, et al. Resting global and regional left ventricular contractility in patients with heart failure and normal ejection fraction: Insights from speckle-tracking echocardiography. Heart 2011;97:287-94. Kraigher-Krainer E, Shah AM, Gupta DK, Santos A, Claggett B, Pieske B, et al. Impaired systolic function by strain imaging in heart failure with preserved ejection fraction. J Am Coll Cardiol 2014;63:447-56. Bello NA, Cheng S, Claggett B, Shah AM, Ndumele CE, Roca GQ, et al. Association of weight and body composition on cardiac structure and function in the ARIC Study (Atherosclerosis Risk in Communities). Circ Heart Fail 2016;9: pii: e002978. Meyer M, McEntee RK, Nyotowidjojo I, Chu G, LeWinter MM. Relationship of exercise capacity and left ventricular dimensions in patients with a normal ejection fraction. An exploratory study. PLoS One 2015;10:e0119432. Lam CS, Grewal J, Borlaug BA, Ommen SR, Kane GC, McCully RB, et al. Size, shape, and stamina: The impact of left ventricular geometry on exercise capacity. 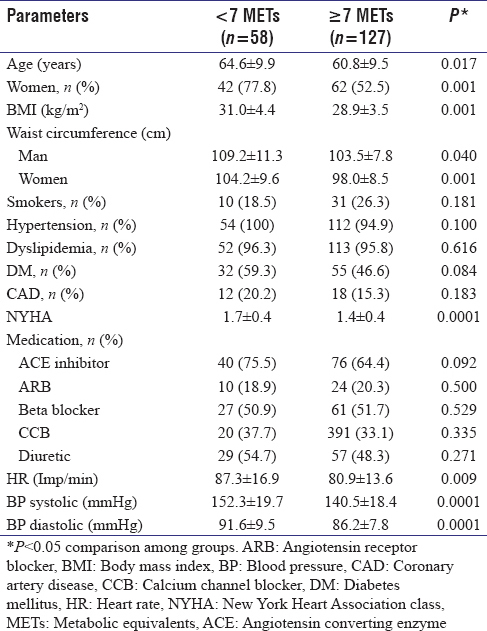 Hypertension 2010;55:1143-9. Skaluba SJ, Litwin SE. Mechanisms of exercise intolerance: Insights from tissue Doppler imaging. Circulation 2004;109:972-7. Otto ME, Pereira MM, Beck AL, Milani M. Correlation between diastolic function and maximal exercise capacity on exercise test. Arq Bras Cardiol 2011;96:107-13. Gupte AA, Hamilton DJ. Exercise intolerance in heart failure with preserved ejection fraction. Methodist Debakey Cardiovasc J 2016;12:105-9. Henein M, Mörner S, Lindmark K, Lindqvist P. Impaired left ventricular systolic function reserve limits cardiac output and exercise capacity in HFpEF patients due to systemic hypertension. Int J Cardiol 2013;168:1088-93. Hasselberg NE, Haugaa KH, Sarvari SI, Gullestad L, Andreassen AK, Smiseth OA, et al. Left ventricular global longitudinal strain is associated with exercise capacity in failing hearts with preserved and reduced ejection fraction. Eur Heart J Cardiovasc Imaging 2015;16:217-24.